It’s time to put on make-up, it’s time to light the lights! It’s time to meet the Muppets... again. Let me say first of all that the Muppets is one of my pop culture loves. One of the earliest TV shows I can remember is Muppet Babies, probably around when I was four or five (the earliest? HE-MAN!). That love has been passed down to Little Brawl, who was freaking out so bad during the premiere I missed half the show. The show feels like a mix of Modern Family (or the Office) and 30 Rock. It’s clearly meant to be a workplace comedy in the faux-documentary style. My biggest disappointment is the lack of the Muppets’ trademark sketches, although a few are hinted at through the show, without being shown. Despite what ABC has been advertising all summer, the show actually starts with Up Late with Miss Piggy already up and running. We meet Kermit as he shares his job as EP and parking spot- right underneath a giant poster of now-ex, Piggy. We meet the cast and learn their roles in a staff meeting- Gonzo is head writer, Fozzie is the announcer and a writer, Scooter is a talent booker, and Bobo the Bear (an underrated favorite of mine) is stage manager. 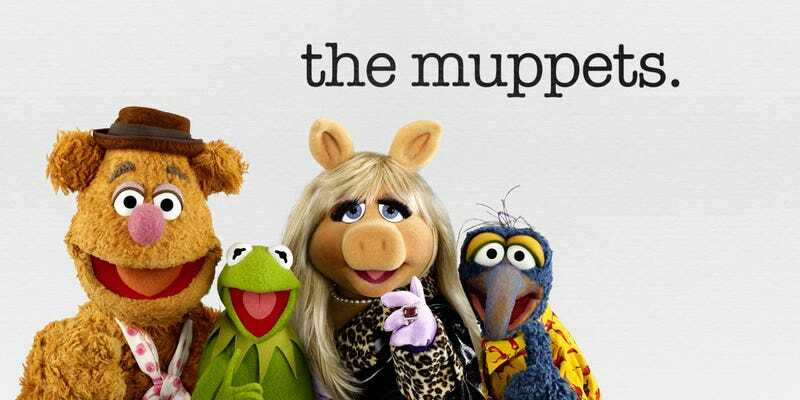 When Kermit shares with Piggy that the following night’s guest is Elizabeth Banks, she instantly vetoes, leaving Kermit and Scooter scrambling. Kermit send Scooter to the set of Dancing with the Stars, hoping the snag a replacement, and gets Tom Bergeron, who really knocked it out of the park with his few minutes on the show. (“I could tell the story of the time I grew a mustache and someone mistook me for Tom Sellick.” “Okay, and?” “That’s it. I look like Tom Sellick.”) However, Kermit’s new girlfriend Denise convinces him to proceed with Banks, and surprise Piggy when she walks out on stage. Meanwhile, Fozzie is doing his best to impress his girlfriend’s parents with a backstage tour of the show. It doesn’t go well. Kermit and Piggy hash it out over Banks, in which we learn they broke up after a screening of Pitch Perfect 2 and a director’s Q&A with Banks, which is why Piggy holds irrational resentment towards the actress. However, the show goes on, and the interview goes off (mostly) without a hitch (for everyone but Bergeron, who Scooter didn’t inform was no longer needed). Lucky for Tom, Scooter promised to send him a salami gift basket (but not the fancy salami). The show closed with Imagine Dragons playing a new song (which I didn’t recognize from Smoke & Mirrors, their latest album- anyone else know it?). Animal joins the group and (naturally) breaks their trademark bass drum. Did you watch last night? What did you think? A return to form or could use some work? And were you also disappointed to not see Gonzo’s Dancing with the Tsars sketch?